PSALMS 23:4 KJV "Yea, though I walk through the valley of the shadow of death, I will fear no evil: for thou [art] with..."
1(A Psalm of David.) The LORD is my shepherd; I shall not want. 2He maketh me to lie down in green pastures: he leadeth me beside the still waters. 3He restoreth my soul: he leadeth me in the paths of righteousness for his name's sake. 4Yea, though I walk through the valley of the shadow of death, I will fear no evil: for thou art with me; thy rod and thy staff they comfort me. 5Thou preparest a table before me in the presence of mine enemies: thou anointest my head with oil; my cup runneth over. 6Surely goodness and mercy shall follow me all the days of my life: and I will dwell in the house of the LORD for ever. Yea though I walke through the valley of the shadowe of death, I will feare no euill: for thou art with me, thy rod and thy staffe, they comfort me. 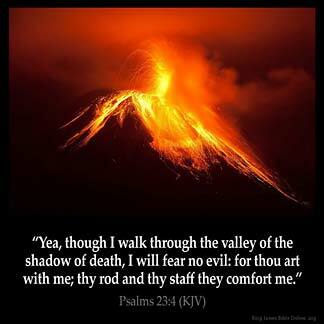 Yes, though I walk through the valley of the shades of death, I will fear no evil: for thou art with me; thy rod and thy staff they comfort me. 23:4 Thy rod and thy staff - Two words denoting the same thing, and both designing God's pastoral care over him. I am comforted In knowing that each and every valley that I experience my God is right next to me giving me strength, peace and power to endure and persevere. Amen! I like the wisdom and knowledge that the psalms provides. We all have valley experiences but we should not choose to lay down while going through. Remember we walk by faith not by site. God has created life so that weapons form. But they shall not prosper. So hold on to the rod. Hold on to the staff and allow the peace of God to be with you. Amen 128522 . When we walk through the storms of our life, God is always there to comfort us and pick us up. We shall not fear but lean of his everlasting arms. If then no staff..if then no rod..all of my days..are set before me..no trial or even all they of the world would be set against ...for he who is in me..is greater..than than this world..and if i live..ill life to love..another day..if i die..greater is he...for death is overcome..and youll be born again. and this world..is by no means a easy world but by the light of holy spirit..it shines such a light unto You ..and we boldly go.. to carry that light.. because its the only thing that will get you through. its from where you are from and walks with you.. its who sent Jesus.. and from where the wind cometh.. and you are greater..even more than all the things made by man..because you are the light and jewel And a temple.. and home of the holy spirit.. for ever..
this verse talks about the fact that no matter what ever you are are going through right now, God allow it to happen to you so that He can turn that situation around for good for you. The fact that you are a christian does not mean thta you will not go through valleys in life, but what is important is how you deal with those valleys when they come your way, always know that every valley you go through, is another time for God to turn your situation around for good.